Charities have had to become increasingly mindful of how much they pay their senior executives in recent years. A spate of negative national newspaper articles, combined with a backlash from some donors, has created an atmosphere in which high pay has become more visible and less acceptable. The argument that charities need to pay high salaries appears lost on the general public too. A poll of 1,000 people by the consultancy nfpSynergy last year found that only 5 per cent felt a charity with an income of more than £100m a year should pay its chief executive £150,000 a year or more. The majority (27 per cent) said they should be paid less than £30,000 a year. But how much do the UK's biggest charities pay their highest earners? In 2013 and 2015, Third Sector analysed the accounts of the top 150 charities by income to identify the 100 charities that paid their senior executives the most. This year, we have repeated the study but also included two smaller organisations known to pay their senior executives more than some of the UK's largest charities (see Methodology in salary table). These were Caudwell Children, the children's charity that was set up by the mobile phone entrepreneur John Caudwell, and the Thrombosis Research Institute. The results reveal a pattern similar to that of previous years, with the highest earners not coming from household-name charities but from philanthropic foundations, charitable private hospitals and arts bodies. The medical charitable funder the Wellcome Trust awarded the highest salary, with its highest-earner paid between £3.05m and £3.06m. The money was awarded to a member of its investment team after its portfolio produced a stellar performance in the year to 30 September 2016. The figure is more than three times the previous highest salary of £1m identified in the 2013 study, paid by the charitable hospital the London Clinic to a former chief executive. The lowest-paying charity to make the top 100 was the education charity Reach2, which paid its highest earner between £140,000 and £145,000. Overall, the average (mean) pay across the top 100 charities was £255,000, compared with £212,500 in 2015. The median pay level rose to £185,000 a year, compared with £165,000 a year two years ago. 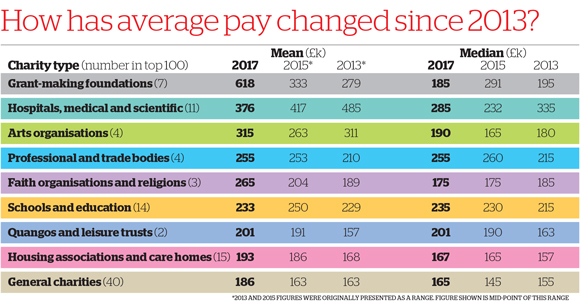 The increases can be attributed to a number of factors, including some of the highest payers - such as the Wellcome Trust, Nuffield Health and the Consumers' Association - paying significantly more than two years ago and the inclusion in the study of high-paying smaller charities. The two smaller charities both made the top 100. Caudwell Children paid its highest earner between £230,000 and £240,000, despite having the lowest annual income in the top 100 - just £8m - and the Thrombosis Research Institute paid the same amount despite having an income of £17m. The British Red Cross also paid its highest earner £173,000, about £30,000 less than in the 2015 study. Fourteen of the top 100 charities paid their highest earners more than £300,000, compared with 12 in 2015. Thirty-seven charities paid more than £200,000, compared with 32 in the 2015 study. But some charities paid their highest earners considerably less than in previous years. The highest-paid employee at the London Clinic earned between £540,000 and £550,000, compared with £850,000 to £860,000 in the 2015 study. The salary awarded to the highest-paid employee at St Andrew's Healthcare has fallen by more than £300,000 since the 2015 study. General charities occupied the highest number of places (40) in the top 100, but they paid the least. On mean average, the highest earners working for general charities received £186,000 and a median of £165,000. The seven charitable foundations included in the top 100 were the most generous on average, paying a mean salary of £618,000. But this figure was driven up by the exceptional pay awarded at the Wellcome Trust. One of the more surprising elements is the number of well-known household charities that have not made this year's top 100. Oxfam, which has an income of almost £415m, paid its highest earner between £120,000 and £129,000, so came 126th in the list. Other well-known charities, including the RSPCA, Unicef UK, WaterAid and WWF-UK, don't feature in the top 100 because they paid less than £140,000. The study also indicates the use of bonuses. The latest accounts of Marie Stopes International show it paid its highest earner a bonus of almost £252,000, pushing their salary up to between £420,000 and £430,000, £160,000 more than in the 2015 study. The latest annual accounts for the Consumers' Association, which operates under the name Which?, show it paid its chief executive £490,000, including a long-term incentive payment. This compares with between £310,000 and £320,000 in the 2015 study. The study also includes the total number of staff in each organisation who were paid more than £60,000. Charities are required to state in their annual accounts how many employees earn above this amount. Save the Children International employed the highest number of staff earning above £60,000 (375), and was followed by the British Council with 339. In the top 100, the International Rescue Committee had the fewest employees earning more than £60,000, paying just two more than this amount. On average, the top 100 charities employed 58 staff earning more than £60,000. Vicky Browning, chief executive of the charity leaders body Acevo, says that the study shows the diverse range of charities operating in the sector. "When you go through the top of the list, none of them are fundraising charities," she says. "It is a challenge for us as a sector to get across to the public the huge range of services that charities provide." She points out that salaries paid by the biggest charities are markedly different from those paid at most charities. Acevo's Pay and Equalities Survey, published in January, found that the median pay among the 473 charity chief executives who responded to its study was £50,000 - £5,000 less than its previous study found in 2015. But Browning says it is important for charities to attract the right talent, and cites the examples of Cancer Research UK and the British Heart Foundation. "These are globally important research organisations," she says. "I want people who can cure problems such as heart disease. I want the best researchers run by the best chief executives to make that happen. Why wouldn't we want quality people running these charities? The stuff they're doing is going to affect us all." Jenny Warner, managing director of Charisma Charity Recruitment, argues that running a charity can be more complex than running a business. "Some of our national and international clients have to deal with many challenging situations and, in order to steer the ship well, the chief executive requires a very special skillset," she says. "This person needs good business skills, an understanding of the political landscape, the ability to manage staff and an appreciation of the needs of beneficiaries." 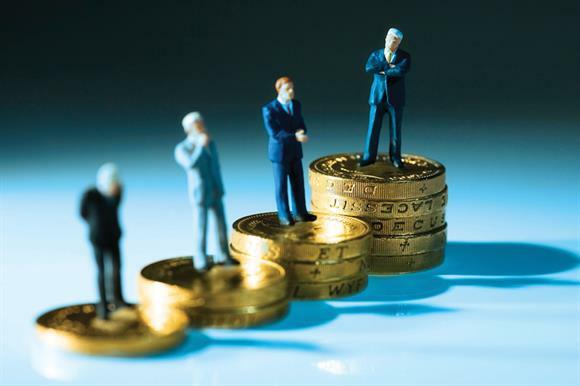 But others in the sector urge restraint over senior executive pay levels. Stella Smith, a governance consultant and Third Sector columnist, says that it is not always clear what special qualities senior manager have that justify such salaries, and neither is there any evidence that over time high pay results in better performance. She believes it is unwise for organisations to become so dependent on individual staff members that they feel they have to pay them substantial amounts. "If charities don't have enough skilled people, surely it would make more sense to invest in developing their staff instead of paying senior managers more," she says. Neil Cleeveley, chief executive of Navca, the community sector umbrella body, says charities also need to be mindful of public trust in charities when setting pay levels. "We cannot justify eye-popping salaries by pointing to comparable salaries in the private sector," he says. "Charities are different, and this includes a commitment to fairness. "Pay should be justified, not just at the top but throughout an organisation. Last year's Purposeful Company Task Force proposed that organisations should engage in a fair-pay process in which chief executives and directors engaged with staff about whether pay was proportional, deserved and driving the right behaviour. Charities paying large salaries to any staff member should take note." The salaries paid by the UK's largest charities to their highest earners are dwarfed by those paid by the biggest companies. Last year, The Daily Telegraph reported that Martin Sorrell, chief executive of the advertising agency WPP, earned almost £43m, making him the highest-paid person in the FTSE 100. Ben Van Beurden, chief executive of the oil company Shell, was the second-highest-paid FTSE 100 boss, taking home a salary of £19.5m, according to the newspaper. Separate pay data supplied by the recruitment firm Page Executive shows that chief executives working for companies with turnovers similar to the incomes of those charities featured in the top 100 list tend to earn more than their charity equivalents. The boss of the casinos company Rank Group, which had a turnover of almost £709m, earned £857,250, including bonuses, but the highest-paid individual at Save the Children International, which had an income of £786m, received between £314,000 and £327,000. The aerospace and technology provider e2v had a turnover of £236m and paid its chief executive £603,000, including bonuses. The charitable foundation the Ormiston Trust had a similar income of £256m, but paid its highest earner between £180,000 and £190,000. Bill Guthrie, business director at Page Executive Scotland, says: "It's no secret that chief executives in third-sector and not-for-profit organisations are paid significantly less than their counterparts in the private sector. Although this gap can be explained by lower turnovers produced by charities as opposed to businesses in the private sector, there is still a lot of debate about justifying such a substantial difference in pay. "The data supplied by Page Executive suggests a closer correlation between charity and public sector pay levels. For example, the chief executive of Network Rail earned about £680,000 and the chief executive of the Environment Agency up to £185,000. On average, chief executives working in the public sector were paid almost £222,000, according to the data supplied by Page Executive. This was £3,000 less than the average paid by the top 100 charities.